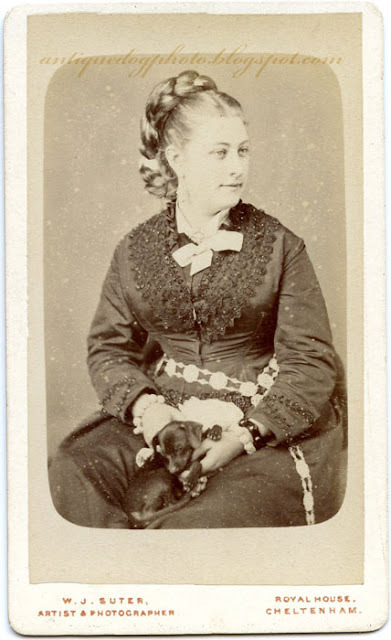 This photograph features a very fashionable lady and her Retriever puppy. She is wearing some very interesting jewellery including a black jet bracelet (possibly from Whitby), Ivory bracelets, an Ivory brooch and elaborate belt. The photograph was taken at Royal House, Cheltenham, Gloucestershire, England by William James Suter. He worked as a miniature painter as well as a photographer. He worked at this address between 1885 and 1897, so we can date this photograph within this period.